Hector Escarcega is a safety hero for his commitment to problem-solving—specifically, his ability to understand the needs and requirements of everyone that he works with. 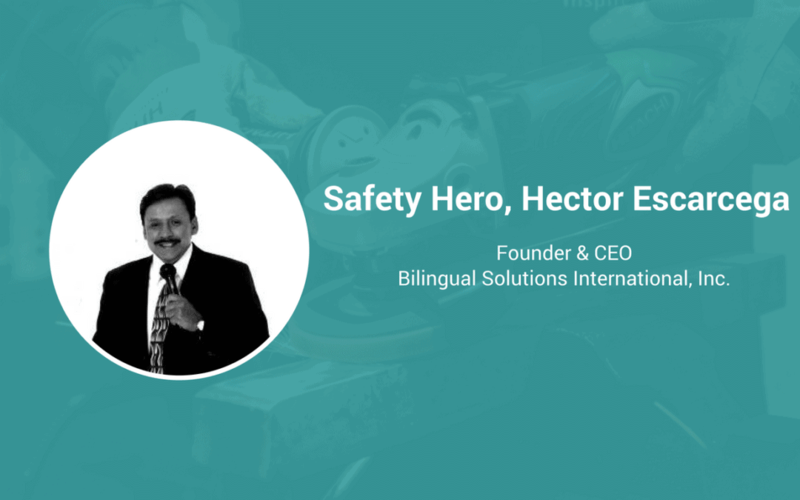 Hector is a top-notch safety consultant that specializes in helping bilingual workforces improve their ability to work together. Hector helps companies to close the communication and cultural gaps which improve productivity, production, safety, and employee morale. Heavily influenced by his father’s experience as a railroad worker, Hector is committed to helping others and to improving overall workplace safety. It’s a noble profession and it feels good to help others. I am a caring person and I want to help others. Helping companies stay safe allows me to do that every day. It’s critical for safety leaders to understand all perspectives in the workplace. You have to recognize that the business owner or manager is focused on performance and profitability; the safety manager is interested in controlling risk and production; the employee is focused on performing their job. Once you understand those perspectives, you can approach each group in the best way for them. The most impactful incidents were those that I witnessed when I was a young boy. My father worked in the railroad industry and he would come home injured all the time. He would go back to work the next day, suffering from pain. We knew that his working conditions were horrendous, but there was nothing that we could do. We were always worried about him. Seeing my father injured all the time really stuck with me, and it sent me down [the] path [of] becoming a safety professional. Some people think that safety personnel are like “police” – that we go through sites looking for hazards and people to write up. That’s not the case. As safety professionals, we are incredibly caring and are truly concerned in preventing accidents and injuries. I’m a tremendous listener, and I pride myself on being genuine and authentic. I always look to better understand situations before I begin working on them, and that helps me as a safety professional. Safety needs to be more about getting to know and caring for people rather than crunching numbers and developing systems. While it is important to set safety goals and objectives, I believe it’s far more impactful for safety people to put themselves in the workers’ shoes to gain an appreciation for their concerns and ideas. Organizations should put a premium on engaging their team members to improve safety, rather than just focusing on setting policy and procedure.